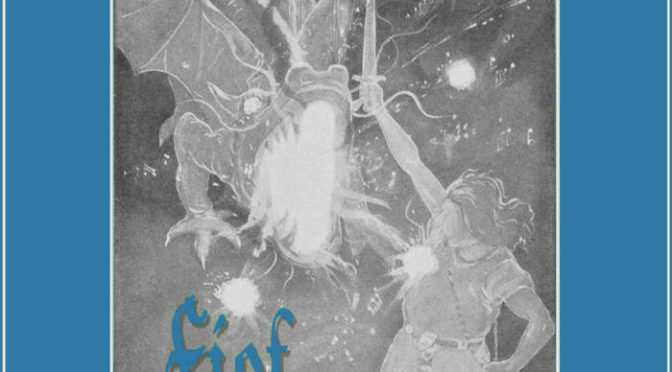 Fief seems to generally have been hailed as the new king (or kings) of dungeon synth. Maybe that’s a stretch to state, but the releases of this unknown outfit are much adored in the genre. Now Fief returns with their third offering of folky music and it seems to have even gotten better on ‘III’. The artist from Salt Lake City in Utah makes what I consider the best bit of dungeon synth, due to its particular foresty sound. There’s a lightness to Fief, a peaceful joy, and gentle vibe. It’s the thing we often lose when we stop reading books and playing video games that beckon. On this record, a new layer appears in the music of Fief. The sound becomes richer, fuller and all without ever losing the tranquility of early digital worlds. Remember those video games, where you could walk around rather peacefully? Or build your own settlement without the pressure of time and resources? I always enjoyed the calm and peace of those and I find them in this music. Listening to the music brings you to that state of reverie. Of simply allowing the tones to wash over you, calm you down. There are two layers of music, dancing around each other in a swift-paced dance that fits best in a tavern or an inn for your RPG game. It’s never overly present, but also interesting enough to capture your ear. It’s just so darn pleasant. So the group of human children that played D&D and accidentally brought the A Band Of Orcs into our world are now dead… except for their DM’s older brother , who tought them how to riff like Slayer. This eased the bloodlust of the tribe, who now embrace metal as a means to conquer and dominate. Blending nerdism and metal is the best, really. Originally this band was a five piece, but the war machine has been thinned down to only three mighty Orcish warriors from their own realm. The whole concept has been worked out pretty brilliantly. Merch consists of a card game, dice and miniatures and the group performs in costume. Though this release is not that new, it was so awesome that I had to cover it. The sound of A Band of Orcs has developed from a blend of Slayer and Norther with the epic balls of 3 Inches of Blood to a more gritty and dirty assault on this record. More directed to death metal, less controlled and with vocals that have crusty feel to it. Maybe something like Kvelertak meets Svartsot in the Amebix basemetn style equipment? It has all the groove and brutality to go there, but also the epic riffing. Sticking to their gimmick, the opening track is a weird war chant with frantic drumming, which launches into the title track. Hoars, shouted vocals rally the troops and indicate agressive action. Hooky, sharp riffs and tumultuous rhythms guide the song to its ultimate conclusion. ‘Heaving Death’ follows after a mad scream and a distorted, hazy assault of drums and guitars. It’s a thundering track and the pinnacle of this ferocious EP. Double vocals, chaotic and definitely wild, this track really harnesses the agression of the Orcish horde in a punked up aural attack. Oog, Cretos, and Gronk! are a deadly machine, so check them out!